Here are some facts about the famous physician, Robert Koch, who worked in Germany during the reign of Queen Victoria, and became known as one of the founders of microbiology. 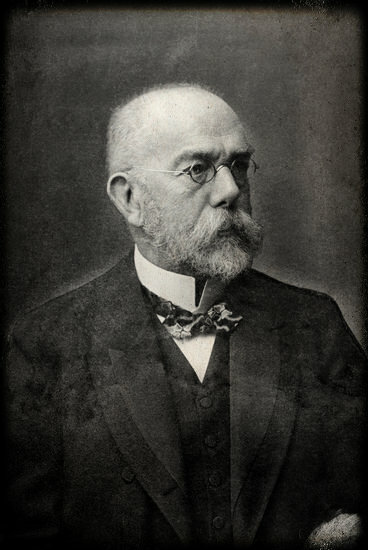 Robert Koch developed methods for isolating and growing bacteria, which included the use of agar plates and petri dishes (equipment still used today). In 1883 Koch worked in Egypt studying cholera, and after that he travelled the world studying other diseases. He went to Soth Africa, India and Java. Koch is best known for his work on tuberculosis. Koch devised four criteria (called Koch’s postulates) which must be satisfied in order to say for certain that an organism (a microbe) has caused a disease. In 1905, Koch was given the Nobel Prize for his work on tuberculosis. Using his microbiology methods, Robert Koch’s pupils were able to work out the organisms which casued diseases such as: typhoid, diptheria, leprosy, bubonic plague and tetanus. Kock was born on 11th December 1843 in Hanover and he died on 27th May 1910. Click here to find out about more famous people who lived in Victorian times. Glad we could help you out. Good luck with your homework! I liked this a lot;thank you. A year on and this is STILL amazing. Thankyou.